As you may know if you've been reading here for a while, I have complicated feelings about Valentine's Day. Sometimes I find it an even stranger holiday than Halloween. And the "chocolate" and gifts that stores market? Most of it is nothing that I would want to give or receive, especially if we're talking in the context of a gift to a special someone. What would be better than cheap, mass-produced, compounded chocolate with a stuffed bear or other article destined for the landfill? Quality, ethically-sourced chocolate from your local chocolate shop, of course. My local chocolate shop? 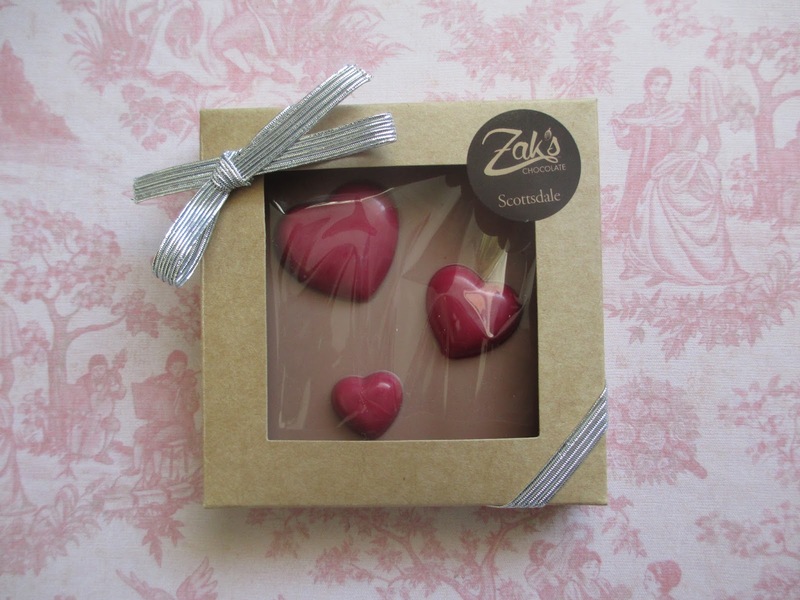 Zak's Chocolate--and what a treasure it is to have this place nearby. I swung by this week to see what they had on offer for Valentine's Day and they are definitely prepared for one of the biggest chocolate-buying times of the year. If you're looking for just a small something, there are chocolate hearts for just $2 each. Something more grand? You can order an edible, heart-shaped chocolate box filled with six truffles for $50. Or you can go for a classic Valentine's Day box of chocolates; you can either get one that's pre-filled or choose your own truffles. For a more simple approach, there are also plain chocolate bars with hearts on them; these are available in white, milk, and dark chocolate. Which of those three bars did I choose? White, of course. (I did also buy a non-Valentine's milk chocolate bar, which I'll review at a later time.) My current trend is to seek out more white chocolate and this bar was the most intriguing and maybe also the prettiest of the three (not that the others didn't look nice, as well, especially the one that had the "powdered sugar" effect that I observed on the Peppermint Mocha truffle back in December). Rather than being as light as the average white chocolate, this chocolate looks almost more like a super pale milk chocolate. The unique look simply begs to be tried. Now, this may sound odd, but I must observe that the aroma of this bar is chocolate, and the reason that I must observe this is because white chocolate generally smells not necessarily of chocolate but of specifically white chocolate or even simply vanilla and sugar. Instantly this chocolate has more of a buttery texture on the tongue, nice and cool and easy to melt. It does seem to melt slower than white chocolates tend to; whether that is the result of a different proportion of ingredients or because this bar is slightly thicker than some, I'm not certain. Quickly in, you do start to get that distinctive white chocolate flavor, yet following right along are caramel flavor and vanilla ice cream notes. Another flavor comes in towards the finish; I can't quite identify it. Almost it reminds me of cloves or maybe licorice, though not so strong or (in my opinion, at least as far as licorice goes) unpleasant; it's just an additional flavor note. I also tried out chewing this chocolate. The effect with that is pretty heavenly, like caramel with the texture of chocolate. In fact, I find myself completely in love with this chocolate. It has so much flavor, which is so unlike the average white chocolate, that it's unbelievable. (Reminder: the only ingredients here are cocoa butter, cane sugar, whole milk powder, and natural color for the hearts.) I don't even feel like I can call this chocolate sweet because that word simply doesn't come to mind when I eat it, even though obviously this chocolate is sweeter than dark chocolate. Which, once again, is what I love: sweet chocolate doesn't have to mean bad chocolate or chocolate without complex flavor. So while this bar does have a higher price tag to it ($12), it is most certainly worth it. Beauty, quality, and flavor. Normally it would be best to do a separate post to talk about the truffles, but given that this is all Valentine's Day material and Valentine's Day is coming up before we know it, everything is going in one long post today. I picked out six seasonal truffle flavors, skipping the Raspberry Passion Fruit Mousse and the Raspberry Rose since I'm not a fan of raspberry. I also skipped the AZ Queen Bee Honey since I've reviewed that one before (this time, though, it comes with the "bee" mine picture image on top). More shapes and colors right now than usual, it seems; now is the time for extravagance. Earl Grey Lavender - A heart with white and purple coloring. Instantly, this truffle gives that zingy zany flavor of bergamot and lavender in tea; incidentally, Lavender Earl Grey happens to be my usual morning tea right now. This truffle definitely captures the flavor of this tea in a stronger way than how tea usually comes across in chocolate bars; this route, then, perhaps works better to truly express flavor. The chocolate is a steady base for this trio of flavors, and the ganache is nice and smooth. Rose - This one is, of course, shaped like a rose--which puts me in mind of all of the beloved Beauty and the Beast imagery. Flavor-wise, though, I don't get this one. I want to really like it because I am a fan of rose, as a scent and in chocolate. But this ganache seems to have more of a general floral flavor than specifically a rose flavor; I'm used to rose being sweeter, whereas this is tangier. Not at all bad, just not what I had expected. Marshmallow - A dark heart. I bit into this one and found a surprise: there is actually a marshmallow inside the chocolate shell. Not a regular marshmallow, though, of course; this is a gourmet marshmallow. It's soft and almost liquid, so it feels like you just roasted it by the fire. And is it just my imagination, or did they add something to give it a hint of roasted flavor, as well? With the marshmallow plus the dark chocolate, in any case, you definitely get a s'mores feeling with this one. So this was a fun surprise, a cute addition to keep the levity in your box of Valentine's truffles. A happy element. Hibiscus Caramel - A lovely flower shape. The caramel inside is stiff enough to not be a free-flowing liquid but not so stiff as candy caramel. Its flavor is fresh and sweet; the hibiscus becomes more recognizable as the chocolate melts away and as the flavor has a chance to settle into your mouth and mind more (because, of course, being caramel, it sticks around for a bit). The caramel is definitely sweet, which makes me think of those times when I've ordered jamaica at a restaurant (I always call hibiscus the flower and jamaica the beverage) only to find that it's sweetened much more than the way that I drink it at home. But of course a caramel would be sweet. The casualness of the caramel put together with quality chocolate and with the floral element works well for both Valentine's Day and for springtime. Prickly Pear - The square with pink and white hearts on top. The ganache here is different; it's the denser kind. Biting in to this texture feels almost more like biting into a brownie. It's quite sweet, too. Do I taste the prickly pear, though? And what even is prickly pear as a flavor? Generally, prickly pear products (like syrups and jellies and lemonades and even margaritas) are prepared with so much sweetness that sometimes it's hard to think of what prickly pear itself tastes like. So I don't know if I'm the only one who would say this, but this truffle mainly just tastes like a light chocolate truffle to me. It tastes nice--and sometimes when I focus on the ganache I can detect prickly pear flavor. Just, once more, maybe not quite what I might have expected. Strawberry - This one has the fruit/berry on top. And you'll notice that I somehow skipped this one when doing my tasting--but since I tasted it last, I have to give my comments last, as well, rather than presenting in the order that's in the picture. The flavor of the ganache here is of a tangy strawberry jelly, you know, the all-fruit kind versus the kind loaded with sugar. So I love that this is more of an actual strawberry angle versus that extra-sweet idea of strawberries and strawberries/chocolate that people tend to focus on most. That ganache is wonderful in its freshness and strength, and it works perfectly with the flavor of the chocolate. The only problem is that the bottom part of the shell is much too thick. Even if the idea might have been to thicken the shell in order to not have too much of the ganache (and have the effect become possibly too tangy), there still shouldn't be this much chocolate in one layer on a truffle. Proportions. The main point, as per usual, is that whatever flavors sound the best to you will probably be the best to you. As far as flavor compilations, the Earl Grey Lavender and Hibiscus Caramel were on top. The Marshmallow and Strawberry were also pretty nice. So whatever assortment of truffles you put together for your Valentine, your friend, or yourself, there is plenty to choose from and it is all much, much better from the shelf-life-of-a-thousand-years "truffles" you'll find at the grocery store. And let's also not forget my beloved white chocolate bar with all the hearts; you would certainly win me over if you gave me that one.